Character matters. 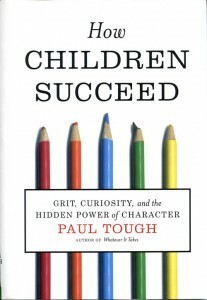 That is the take-away from Paul Tough’s book, How Children Succeed: Grit, Curiosity and the Hidden Power of Character. Tough reminds us of the central importance of a person’s character to learning. In this highly readable book, the author seamlessly combines educational research with interviews and first-hand accounts of inner-city children who have beaten the odds and gone on to achieve success in academics and vocations. Along for the ride, a reader is challenged to depart with the conventional wisdom and reassess the foundation of educational policies concerning remediation and academic success. Paul visits several schools that are succeeding in economically disadvantaged areas like the Bronx, Harlem and Newark. More than pounding away at basic skills, these programs have a common focus on building a student’s character to become successful lifelong learners. Among the traits he cites as important to learning include resilience, self-control, resourcefulness and curiosity. Such traits, even more than academic deficiencies, are what really holds intelligent students back. The good news is that many of the best K-12 programs in disadvantaged communities are directly addressing the issue of character and are producing impressive results. Two of the most important executive functions are cognitive flexibility and cognitive self-control. Cognitive flexibility is the ability to see alternative solutions to problems, to think outside the box, to negotiate unfamiliar solutions. Cognitive self-control is the ability to inhibit an instinctive or habitual response and substitute a more effective, less obvious one. Both skills are central to the training Spiegel gives to her students . . .
Should Character Be Part of Education? Conservatives could argue that schools should not be teaching things that are the domain of parents, and a child’s character training is one such domain. Liberals would take a different tact with the “it takes a village to raise a child” philosophy espoused by Hillary Clinton. I feel two questions need to be addressed. First, “Should character be taught?” and second, “Would it be useful to teach character?” I would argue “yes” to both questions. There has been a noted breakdown of community and family institutions that in the past would have a role in developing a youngster’s character. With these gone or diminished, I feel there is a need to fill the void, particularly in urban or rural communities struggling economically. Moreover, the evidence that Tough cites shows that early intervention can have a major impact in imparting traits like grit, curiosity, self-control and optimism. A trait like curiosity is worth examining. For many of us who have taught high school or beyond, we encounter students that have quite a blase attitude when it comes to learning. Whether it is learning in the classroom or outside, their curiosity has been dampened, along with their potential for learning. How did they go from innately curious infants to bored and listless high schoolers? Maybe Einstein had it right when he stated that “It is, in fact, nothing short of a miracle that the modern methods of instruction have not yet entirely strangled the holy curiosity of inquiry.” Besides poor instructional methods, parenting and the home environment also have a major influence in stamping out curiosity about the world we live in. Optimism and persistance are specific traits that Tough believes have a positive impact on learning. Optimists are better learners since they see the importance of learning and believe they can exercise agency in their lives. At any age, lifelong learning becomes essential for success, and optimists are more likely to invest time for it to happen. Persistance is overcoming the inevitable obstacles in the path of learning. This trait correlates to the “time on task” research that clearly demonstrates that the more time spent on learning, the greater the mastery. Together, optimism and persistance form the “grit” of a person’s character that propels academic and worldly achievements. From grade school through college, remedial programs struggle to raise students’ academics through a variety of supplemental instruction. Without directly addressing the issue of character, preferably in the early years of schooling, such efforts will at best produce half-results. As Tough’s wonderful book illustrates, programs that address a student’s character, in addition to academic deficiencies, may have the best chance of turning around students floundering in school, and can also provide them the character traits needed to succeed in life. 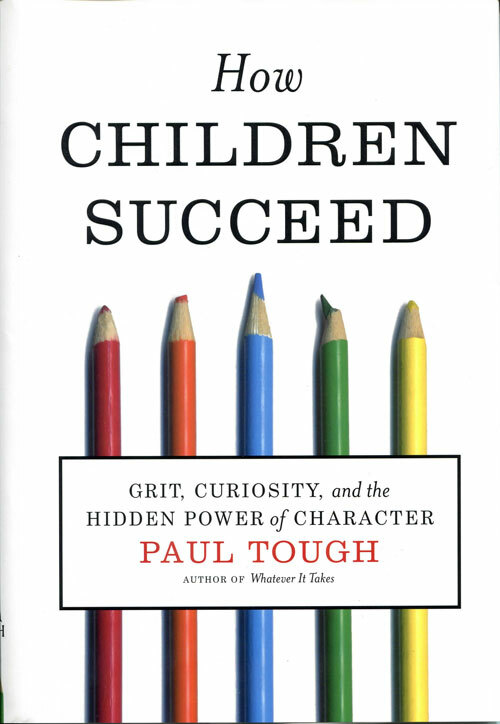 Tough, Paul, (2012) “How Children Succeed: Grit, Curiosity, and the Hidden Power of Character,” Houghton Mifflin Harcourt, Boston, MA.